Rhode Island’s Quahog Week will be held March 26 to April 1, 2018. The annual event highlights the importance of Rhode Island’s wild shellfish harvest to the state’s history, traditions, and economy. At the launch event in Providence, Rhode Island, local shellfishermen will be on hand to educate guests about their profession. Guests will also enjoy a raw bar courtesy of the Rhode Island Shellfisherman’s Association, and creative preparations of the quahog, courtesy of participating local restaurants including Easy Entertaining, Eli’s Kitchen, Matunuck Oyster Bar, and Nicks On Broadway. Beverages will be provided by Rhode Island’s own Yacht Club Soda. Rhode Island is known for its food and diverse food cultures. The state’s local food sector supports more than 60,000 jobs and continues to attract and inspire the imagination of entrepreneurs and innovators. The local fishing industry has been, and continues to be, a vital part of the equation. The commercial industry, which includes both wild harvest and aquaculture operations, generates close to $200 million in annual sales, supports nearly 7,000 jobs, and generates about $150 million in annual income. Last year, more than 22 million quahogs (off-the-boat value of $5 million) were harvested from Narragansett Bay and local coastal waters. To support continued industry growth, the state, along with its partners, developed the RI Seafood brand to uniquely identify local seafood in the marketplace and to provide a brand under which local seafood events and activities can take place. 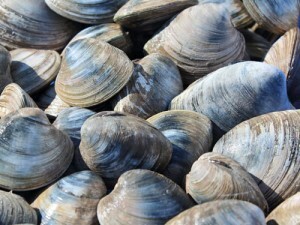 For more information on Quahog Week and/or a list of participating restaurants and markets, visit www.seafoodri.com. Rhode Island seafood lovers can also join the conversation in social media, using #QuahogWeek.